They say that imitation is the sincerest form of flattery. If so, then Robert Conti must feel very flattered these days because he seems to have scores of imitators who have just “discovered” the value of teaching without modes or scales. Not that I have anything against teaching with the best methods available, or changing course when you find something better, but let’s give credit where it’s due. I’ve seen Robert Conti abused for decades for daring to teach lines instead of scales and modes, so I think a little appreciation for his pioneering work is in order. And speaking of pioneering teaching, Robert Conti’s Ticket To Improv series has been a goldmine for guitarists wanting to learn jazz soloing. Ticket To Improv Volume Four returns to the formats of the first two volumes with solos for 4 of the most beloved and requested jazz standards ever written: Days of Wine and Roses, Bluesette, Wave, and Georgia On My Mind. Ever attentive to his student/customers’ requests, Mr. Conti gave us the best introduction to jazz blues that I have seen or heard with Volume 3 of this great series, and now he returns to soloing over these new tunes with renewed vigor and invention. These truly are solos that you can “take to the gig” and they will amaze your friends as much as they impress your audience. 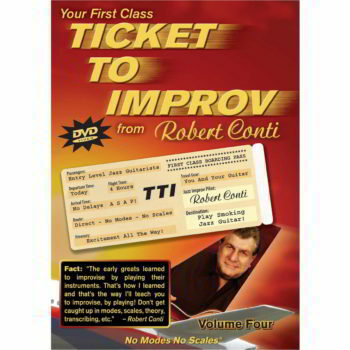 When I review any learning product I work through it, and I have to tell you that I always look forward to a DVD from Robert Conti. I always learn and lot and have a blast doing it. This DVD represents a great bargain. Beyond learning four outstanding jazz solos, you get real-world playing tips from a master who really remembers what it was like struggling to learn to improvise. Robert Conti’s on-going comments are more than worth the price of the DVD, even without the solos. There is more useful information here than most teachers would pass on in months of lessons. The solo lines themselves are miniature works of art, and these are only “beginner” lines insofar as speed is concerned; as Robert Conti demonstrates, taken at speed or with a few embellishments any of the sections of any of the solos would be more than welcome on a professional recording. These are not exercises, they are music. A very clever touch is the use of variations of motives used in the previous Ticket To Improv volumes, making each one an incremental learning resource. Devices such as extended chromatic passing note motions and extended chord tone arpeggios reappear in new tunes over different chord progressions, modeling for the learner the inner workings of Mr. Conti’s deep knowledge of improvisation. While you do not need to have worked through any of the previous volumes to learn this one, those who have will find their knowledge and confidence growing at an even greater rate. It’s almost as if Robert Conti is tricking you into becoming a much better improviser by having so much fun. Wave is another great solo and one that departs from the standard 32-bar format which adds even more variety to the material here. Once again this solo is “entry level” in that any guitar player with basic technique will be able to master it, but in any other sense it is truly “pro level.” Mr. Conti demonstrates this on a few phrases here, and I can corroborate what he says. I’ve actually slowed down some of his recordings and many of those lines are found in the solos on the Ticket To Improv series, at slower tempos and in some cases slightly simplified. In fact, many of the “off the sheet” tips that Robert Conti provides are ways to take these lines to the next level while developing your own personal style. Quite a “bonus”! For those who may not know, when discussing improving speed and accuracy Mr. Conti refers in passing very quickly to “another DVD” – this is his Precision Technique, which I highly recommend to anyone wanting to improve both speed and accuracy in their playing. Of course you don’t need blinding speed for these solos since they sound very good at almost any tempo. Bluesette is a nice addition that will give you some experience soloing in 3/4, which sometimes gives the impression of going faster than the actual tempo since the bars are shorter. Another great bonus of this DVD is the ways that earlier motives are re-used to fit over different chords and progressions. This not only demonstrates how to adapt these lines yourself; it also gives you insight into how Mr. Conti himself views the guitar neck and how he can improvise at such blazing speed. A related point is how to change positions smoothly and how to use the entire neck, rather than being handcuffed to a single position. This actually gave me a moment of concern when I first worked through Georgia On My Mind. This is one of my favorite tunes, and I had been hoping to see it on a volume of Ticket To Improv, but when I saw that it was the Bonus Project – one that would consist of sections of the previous solos re-purposed – I was a bit worried that the solo might not be of the same level as the others. I need not have worried! This might be the finest of the solos, and it certainly does justice to this great song with a solo that anybody would be proud to play in concert. It is just as valuable as a lesson on taking parts of lines and reworking them over similar (and even some not so similar) chord progressions. If you can take musical phrases from Wave and Bluesette and play them over Georgia, you are well on your way to being able to solo over virtually any standard. Never one to put his name on another’s work, Robert Conti is scrupulous in giving credit to guitarists from whom he has learned ideas, licks, tricks, and techniques, greats such as Howard Roberts, Pat Martino, George Benson, and Wes Montgomery to name just four. However, the goal here, as in all of Robert Conti’s teaching products, is for you to develop your own style, and to sound like yourself, not a copy of anyone else. I highly recommend this DVD to anyone who wants to learn to improvise better and to have great fun while doing just that. Order it direct from RobertConti.com. Congrats. Thanks for the heads up. Jason, you are definitely welcome. By now you know that you have one of the very finest products for learning to improvise jazz. Coincidentally, I was trying to post to my own blog about the whole TTI series when the power went out. It seems that the whole area I live in is a flood zone and internet service and power is spotty, but when we’re back up fully I’ll be talking about the whole series. I’m glad you found this first!